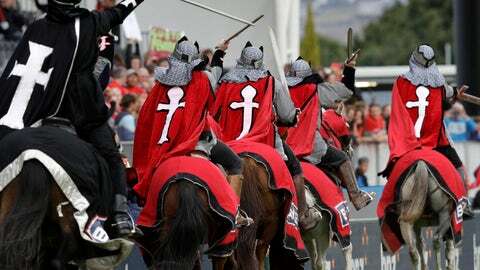 WELLINGTON, New Zealand (AP) — The Crusaders Super Rugby team has dispensed with the knights on horseback which have been traditional mascots in pre-match entertainment after attacks on two mosques in Christchurch provoked criticism of the name and symbolism. New Zealand Rugby says the branding the Christchurch-based club has used since Super Rugby began in 1996 is “no longer tenable” after the mosque shootings which left 50 dead. A marketing company has been engaged to examine alternatives, including a name change or a change of branding which might make the name less contentious. “In the wake of the Christchurch attacks, it is apparent that the symbolism the club has used, combined with the Crusaders name, is offensive to some in the community due to its association with the religious Crusades between Christians and Muslims,” NZR chief executive Steve Tew said on Wednesday. The Crusaders had delayed making changes after the March 15 shootings, arguing that the decision should be reserved until a less sensitive time. “This is an event that rocked our community and brought some important issues to the fore,” Mansbridge said. “One of the contentious issues that has been brought up in the aftermath of the Christchurch attacks is the name of our rugby team – the Crusaders. Mainsbridge said a name change would not take place this year as the club would have to take into consideration the feelings of fans who have a strong emotional tie to the name. But Tew said the current symbolism, which included the use of the crusading knights on horseback, would have to change. Tew said marketing experts would investigate two options: either retaining the Crusaders name but changing the branding and associated imagery, or undertaking a complete rebranding.